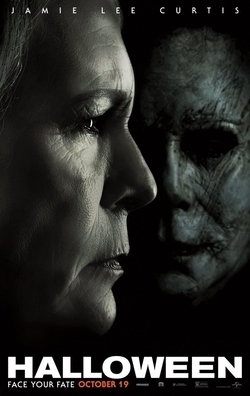 “Halloween,” the direct sequel to the 1978 original, offers more of the same punky, slashy entertainment under new creative hands who have a clear love and understanding for what made its predecessor so effective and influential. But what it lacks in originality, it gains in intertextual nostalgia and a knowing edge that make the movie that much more enjoyable and serviceable. “Serviceable” is exactly the word to describe this movie — meaning that, despite a couple of nice added touches from acclaimed director David Gordon Green, it isn’t without some pretty glaring flaws. It’s 40 years after the events of the first film, both within the world of the story and in terms of the two films’ release dates. Laurie Strode, reprised by an older but sprightly Jamie Lee Curtis, is still traumatized by the murders of her friends from the original film and has taken extreme measures in preparation for the murderer Michael Myers’ inevitable escape from prison. She is so against the government keeping him alive in prison that she even prays for his escape so that she can kill him once and for all. Unfortunately, her paranoia has resulted in two failed marriages and the loss of custody of her now estranged daughter; her daughter was taken away since Strode had been obsessively and abusively preparing her for Myers’ return as soon as she was born. Strode also has a teenage granddaughter who has been trying to reconnect with her nearly deranged grandmother despite her mother’s understandable objections that stem from a traumatic childhood. How each of these female characters across three generations and their interrelationships change after Myers returns serves as the emotional core of the story. To start with the positives, the choice of David Gordon Green as director has some unexpected but welcome outcomes. Green is a director most known for his comedies, such as “Pineapple Express” with Seth Rogan and James Franco, and dramas, such as last year’s underrated and overlooked “Stronger.” His experience with both genres makes for a surprisingly wry and oddly sweet sense of humor and some pretty convincing family drama. Quick comedic glimpses into victims’ personal lives and personalities serve as an effective and economical method in adding depth to these minor characters and fostering the audience’s attachment to them right before their unsightly end by the stoic killer. The film also contains plenty of delightful but also meaningful references to the original and other genre call-backs such as babysitters, high school drama, and teenage indulgence, even if certain subplots regarding these teenagers render the film a bit unfocused and detract from the core of the story. As for the negatives, the choice of David Gordon Green as the director also has some predictable and rather unfortunate consequences. For one, he has never directed a horror movie, and his lack of experience with the genre really shows. Horror movies live and die by atmospherics, dread, and shock value, of which “Halloween” has very little. As a result, the film feels breezy, inconsequential, and is just not very scary. Additionally, Green seems to believe that his experience with comedy movies will help him juggle between scares and laughs throughout the runtime, and heighten the emotional impact of both by way of juxtaposition. If done correctly, this would stay true to the shifting tone of the original “Halloween” and would recreate the winning formula of last year’s horror sensation, “It”. But you can’t have a successful balance between the scary and the funny if you’re much better at one than the other. Consequently, you have a movie that is more funny and predictable than it is scary and suspenseful. But perhaps that’s the point. In an age of increasingly implausible, foolish, and CGI-dependent horror movies, it’s oddly refreshing and reassuring to have an unpretentious slasher flick out this Halloween that just wants to have some campy, gory fun, relying on more relatable domestic drama, fears, and violence than the supernatural. Following Michael Myers in one continuous long take from house to house with kids running around on Halloween night is still as terrifying and effective as the original’s famous long take four decades ago. And it just might convince you to check underneath your bed, inside your closet, and behind the curtains at night. Happy Halloween.